Dan Coates's Decade by Decade series is jam-packed with the best pop music of the 20th century. Never before has there been an Easy Piano collection with so many chart-toppers by award-winning performers and songwriters. Descriptions of each piece are included to broaden understanding of pop music history and to put all of these megahits into perspective. Each song also includes lyrics and chord symbols. 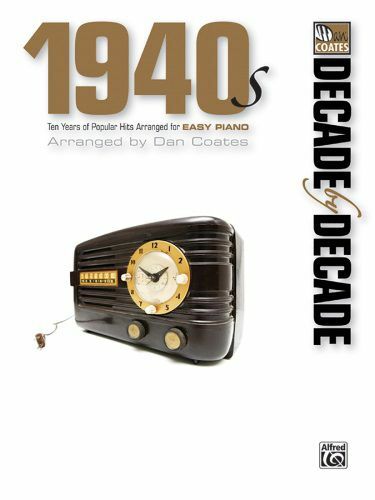 With so many years of great songs, the Decade by Decade series is sure to appeal to pianists of all levels and ages.Titles: Another Op'nin', Another Show * As Time Goes By * At Last * Because of You * Bewitched, Bothered and Bewildered * Blues in the Night * Chattanooga Choo Choo * Come Rain or Come Shine * Diamonds Are a Girl's Best Friend * Don't Fence Me In * Don't Get Around Much Anymore * Don't Sit Under the Apple Tree * Fools Rush In * How Are Things in Glocca Morra? * How High the Moon * I Could Write a Book * I’ll Walk Alone * La Vie en Rose * Laura * Mairzy Doats * Moonlight in Vermont * Moonlight Serenade * My Foolish Heart * New York, New York * Opus One * Over the Rainbow * Polka Dots and Moonbeams * Rum and Coca-Cola * Shangri-La * Skylark * So In Love * Speak Low * A String of Pearls * Swinging on a Star * The Syncopated Clock * Taking a Chance on Love * The Trolley Song * You Make Me Feel So Young * You'll Never Know * Zip-A-Dee-Doo-Dah.